During the religious ceremony at this Roma's Hospitality Centre wedding we had to follow strict rules with regards to wedding photography. First, we could not use flash during the ceremony and we had to depend on the ambient light in the church. Fortunately, during this June wedding ceremony, the light was good and allowed us to take gorgeous images of the ceremony, the bride and groom and the guests present. Second, the priest informed us that we could not move freely around the church during the ceremony. That drastically reduced our liberty to angles for our shots. 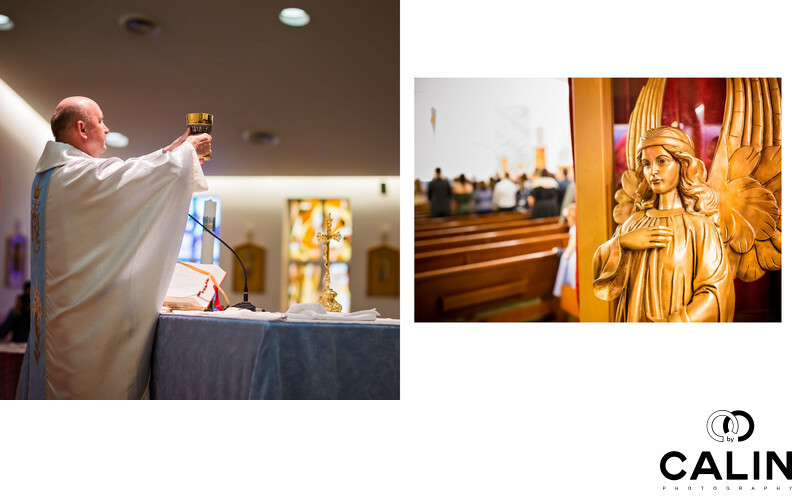 The image on the left showcases the priest raising the ceremonial glass that contains the blood of Christ. By lowering my stance, I was able to use two lights to create leading lines towards the priest. The second image on this album spread, placed on the right page uses the depth of field to tell two stories. In the foreground, an angel looks towards the bride and groom and gives her blessing. In the background, slightly out of focus, we see the friends and family that accompany the newlyweds praying in unison. Because I was not able to come close to the altar, I had to use a medium telephoto lens for the image on the left. I used a wide-angle lens to capture the image on the right. From a processing standpoint, I colour corrected the images, then apply dodging and burning emphasize the sections of the pictures that are more important. Finally I increased the sharpness in both images and the vibrance of the colours.